Rob Hamilton | Morrow County Sentinel Jenna Shipman placed seventh in the Division III long jump on Friday to highlight the Mount Gilead performances at the state track and field meet. Rob Hamilton | Morrow County Sentinel Austin Hallabrin came close to placing in both the 1600-meter run and as part of the 3200-meter relay in the Division II state meet. Rob Hamilton | Morrow County Sentinel Lydia Morgan ran in the 300-meter hurdles Friday for the Highland track and field program. Rob Hamilton | Morrow County Sentinel Mount Gilead’s Rachel Bush battles down the stretch with a competitor during the first leg of the 1600-meter relay. Rob Hamilton | Morrow County Sentinel Joseph Elson anchored the 3200-meter relay for Mount Gilead Friday. Rob Hamilton | Morrow County Sentinel Mount Gilead’s Bryanna Bolha finished her high school track career by running in both the 3200-meter relay and 1600-meter relay in the state meet. Rob Hamilton | Morrow County Sentinel Rebecca Kindred takes the baton in the 800-meter relay after receiving the handoff from Makaylee Elkin. Rob Hamilton | Morrow County Sentinel Sawyer Shipman raced in the 300-meter hurdles for the Mount Gilead boys’ track team. Rob Hamilton | Morrow County Sentinel Hannah Bush closes in on the finish line in the 3200-meter relay for the Mount Gilead girls’ team. Rob Hamilton | Morrow County Sentinel Morgan Brooke races down the stretch in the 1600-meter relay for Mount Gilead Friday. 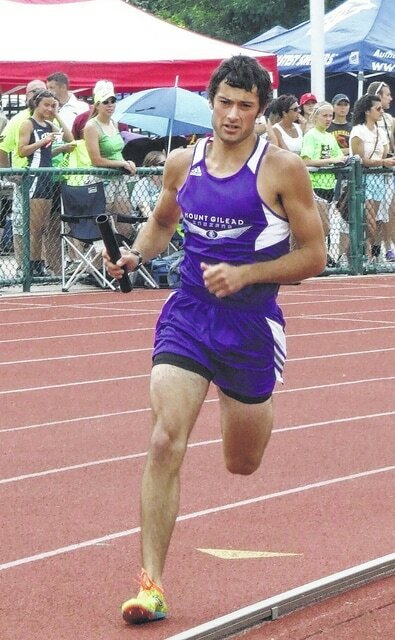 Rob Hamilton | Morrow County Sentinel Tyler Beck runs in the 3200-meter relay for Mount Gilead in action from Friday at the state track and field meet. After reaching the podium in the state track meet as a member of two relays last year, Mount Gilead junior Jenna Shipman was able to do so as an individual in the Division III long jump on Friday at Jesse Owens Memorial Stadium in Columbus. Shipman placed seventh in the event with an effort of 17’2”. She had that jump on his third and final preliminary attempt to ensure her a spot in the top nine that would advance to the finals. While she wouldn’t better that jump in her final three attempts, she was still able to earn a spot on the podium. In most track meets, the long jump is contested early in the competition, often before running events have started. However, on Friday, Division III field events started after all of the running events for that day had taken place. That set up a competition in which the Indian athlete felt went great. Her seventh-place finish provided Mount Gilead’s only two points of the day. Still, the girls’ team had won every meet it had competed in before the state meet, including both districts and regionals. Shipman noted that this season has been a great experience. Shipman came close to placing in another event along with teammates Rachel Bush, Bryanna Bolha and Hannah Bush. In the 3200-meter relay, the quartet missed the podium by about 3.5 seconds, finishing 10th in 9:46.44. Shipman, Rachel Bush and Bolha also ran with Morgan Brooke in the 1600-meter relay, but didn’t advance to the finals. They had the 16th time in qualifying of 4:13.77. Olivia Brewer finished 12th in the semifinals of the 100-meter dash in 12.78 and was 14th in the 200 with a time of 26.56. She also ran in the 800-meter relay with Brooke, Makaylee Elkin and Rebecca Kindred, where they were 15th in 1:50.12. In the Division II 1600-meter run, contested on Saturday, Austin Hallabrin nearly rallied to the podium in the final lap. After running near the back of the pack for a good portion of the race, the Indian sophomore started to pick off runners during the final 400 meters, finishing in ninth place with a time of 4:26.21 to finish one spot away from the top eight. Hallabrin also run on Friday in the 3200-meter relay along with Tyler Beck, Ethan Hatfield and Joseph Elson. That quartet also came close to placing, as they finished 10th in 8:03.71, roughly 2.5 seconds away from eighth place. Also competing was Sawyer Shipman in the 300 hurdles. In Friday’s semifinal heats, he finished 13th overall with a time of 40.51. Lydia Morgan represented the Highland track program in the Division II meet. Competing in the semifinal heats of the 300-meter hurdles Friday afternoon, the Highland junior placed 15th with a time of 49.99.